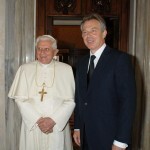 Former British Prime Minister Tony Blair entered the Catholic Church in 2007, several months after leaving office and apparently many years after beginning a serious journey toward Her. In reading accounts of his conversion I came across an interesting event during his tenure as PM that might have indicated, even back in 1999, that his Catholic formation regarding use of force was well underway. In April 1999 Blair had been invited to speak at the Economic Club of Chicago’s annual meeting, where he presented what became known as the “Blair Doctrine” of international community building including guidelines for warranted military intervention. At the time the Kosovo War was raging and NATO had begun airstrikes to drive Yugoslav forces out of Kosovo; the year before the United States and Britain had conducted airstrikes against Iraq in response to Saddam Hussein’s lack of coordination with UN arms inspectors, and the U.S. had sent cruise missiles into Afghanistan and Sudan in retaliation for the embassy bombings in Kenya and Tanzania. If, how, and why intervention should occur was a naturally hot topic that has only gotten hotter a decade and a half on. At the 1999 Economic Club of Chicago meeting Blair articulated the conditions for intervention with five questions Catholics should find familiar. “First, are we sure of our case?… armed force is sometimes the only way of dealing with dictators. I’ve read a lot of skeptical commentary about Blair’s conversion, questioning his intentions, his sincerity and his orthodoxy. Some, perhaps most, of the criticism has legitimate foundations. Nonetheless I find the Blair Doctrine to be consistent with my understanding of “just war;” and in fact I’ve begun considering it in the confounding context of ISIS and their asymmetric tactics. How does one attack an evil enemy that has no “dictator” at its head and is embedded in an otherwise (at least partially) innocent population? Is it necessary for the Church to revise or clarify the just war doctrine for Christianity’s modern day adversaries?